That gave the company IWC Olympic champion Alexei Nemov on holiday? Birthdays are almost always an occasion for something new and beautiful, especially for celebrities. May 31, 2012 in Moscow, celebrating his birthday celebrated gymnast and multiple Olympic champion Alexei Nemov, who invited to his feast of various celebrities. Thus, among the guests there were policies, Sergei Mironov, State Duma Deputy Svetlana Khorkina, restaurateur Anton Tabakov, actor Sergei Belogolovtsev, Deputy Minister of Sport Paul Korobkov, TV presenter Maria Kiseleva, lawyer Pavel Astakhov and musician Sergey Mazaev. As far as a musician, he gave a small birthday concert, which became the most electrifying moment of the entire festival. However, not only the concert and congratulated by distinguished guests were the events of the holiday. 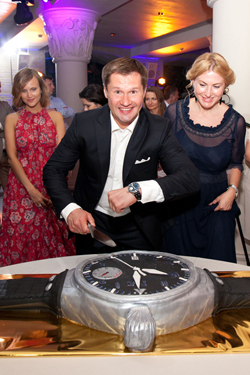 Thus, the birthday boy presented to the public watches IWC Big Pilot’s Watch Edition Alexei Nemov, limited edition and created in his honor manufactory IWC Schaffhausen. Manufacture IWC Schaffhausen – Swiss watch manufacturer, has won its hour market activity based on the use of modern technological development and high technology since 1868. 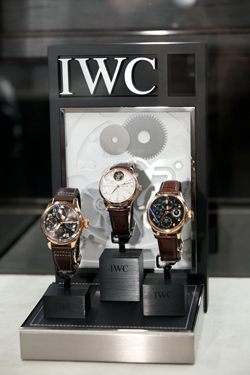 Today, IWC – one of the world leaders who hold significant positions in the segment of luxury watches. Birthday gift from the model and was the main birthday gift. The athlete was personally involved in the design hours. Watches Nemov made in colors of the Russian tricolor. On the back of the engraved image of an athlete who performs exercises on uneven bars. 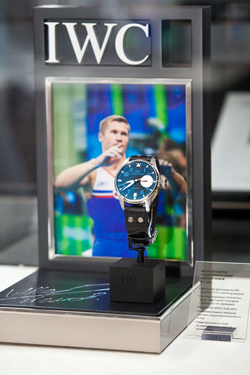 Watches IWC Big Pilot’s Watch Edition Alexei Nemov presented in a limited edition of 50 copies. As for this particular number, it is also not accidental. As it turns 50 – Alexei Nemov’s favorite figure, and 50 copy of the collection went to him. Present for birthday presents eminent Henning von Bodin, IWC Brand Manager in Russia. And, of course, what holiday without music, note, returning to the concert. So, congratulations series perfectly complemented the group of “moral code” and its longtime lead singer Sergei Mazaev each Nemov, and also “friend” watch brand IWC Schaffhausen in Russia. As far as the celebration itself, it was held in the historic center of Moscow in the cozy restaurant «The Garden,” where he personally met the hero of the occasion at the entrance to all guests. And they, note, there were many – 120. We think, of particular note among the present leadership in the evening Julia Bordovskikh, which in addition, that is an old friend Nemov, and interestingly was one of the sports commentators NTV, covering all sports victories Nemov. Buy watches IWC Big Pilot’s Watch Edition Alexei Nemov can have official representatives of the company. Omega is the Olympics in timekeeper 25 times!